Have you ever been in a hurry to get to work and you’ve realized it’s winter and you didn’t defrost your car? This can leave you in a hurry to get your windows clean so you can be safe on the road. Use these tips for getting where you need to go faster with the cold elements! Keep an ice scraper with you. Having it inside the car won’t help if your car doors are frozen shut. Keep a small one in your bag. As soon as you get to your car and can get inside it, turn the car’s defroster on and crank up the heat to full blast. This will get your defroster going before you scrape your windows. 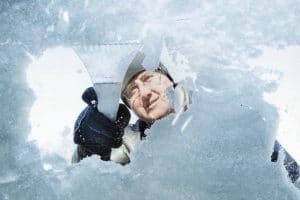 Never use a spatula, metal objects or other items to scrape your windows. This can scratch up your glass. Ice scrapers are designed to not scratch your windshield. Keep a deicer with you. You can buy these at the store or make your own at home. If you do the at-home version, you mix ⅓ parts water with 2/3rds part rubbing alcohol. The freezing point of rubbing alcohol is 138 degrees lower than water, so it wills tay liquid in your car in the cold. These deicers can melt ice in seconds. Some studies suggest that you turn off the air circulation in your car as you have the defrost heater on. This keeps all the heat flowing to your windshields. Never pour water on your windshield, especially warm or hot water. This can cause cracks in your windshield because of such opposing temperatures of the water and the ice. In the winter, you want to always keep an ice scraper in your car to remove snow and ice. Keeping a second outside the car to remove heavy snowfall that prevents you from getting your scraper inside the car. 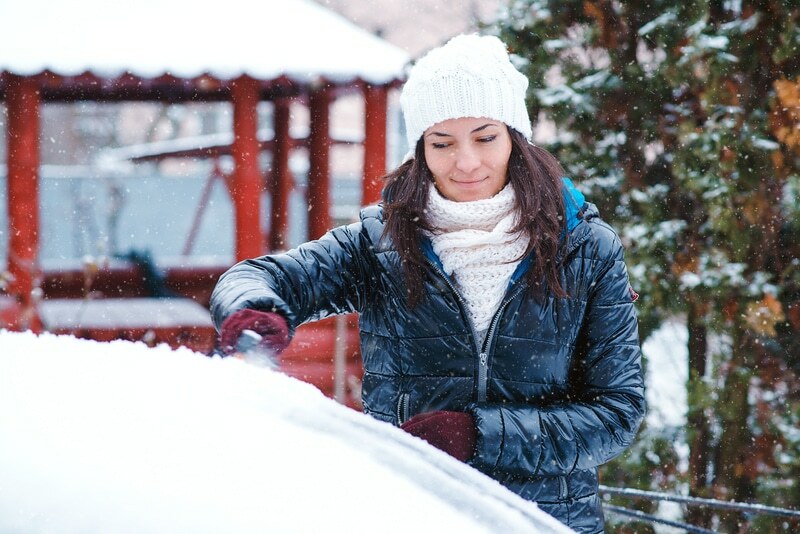 Keep enough wiper fluid in your car to wipe away salt streaks that are common with melting snow on the roads. In a bind, keep some napkins or a cloth in your car that can work for wiping the windshield or mirrors if you must pull over. These come in handy for car spills and for wiping the seat down when it’s wet. In heavy snow areas, it can be common to get stuck in accidents or on the snowy roads, especially during high-traffic times. In snowstorms, people could be stuck overnight in their cars. Prepare for those times with warm blankets, food and water storage tucked away in your trunk. These can be in your emergency kit. It may not be a bad idea to get snow tires on your car in the winter that you switch out with your regular tires in the off-season. Snow chains kept in the trunk can help for mountainous terrain. No matter if it is the dead of winter or a warm summer night, you should always be prepared when you’re going out on the road. Anything could happen, as no one plans for car accidents, traffic jams, or a tire blowing out. Especially in the winter, it’s smart to have an emergency pack with you that can hold you over until you can get to your destination. Many people get stuck on the side of the road with car issues or they get stuck on the road in snowy conditions. Sometimes, snowstorms or road conditions can cause traffic jams for hours and you don’t want to run out of food, water, or a way to communicate, especially if you have to stay in your car for any reason. Kitty litter and/or salt. The litter can be used to get traction in snow and to absorb odors from spills. Salt can be used to melt snow or to weigh down your car if it’s needed in the winter. Whether it’s with defrosting your car windows or keeping an emergency kit, it’s best to always be prepared. 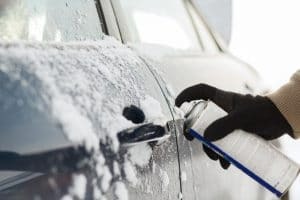 Use these simple tips to do that defrosting right and call Scott’s Fort Collins Auto at (970) 682-4202!